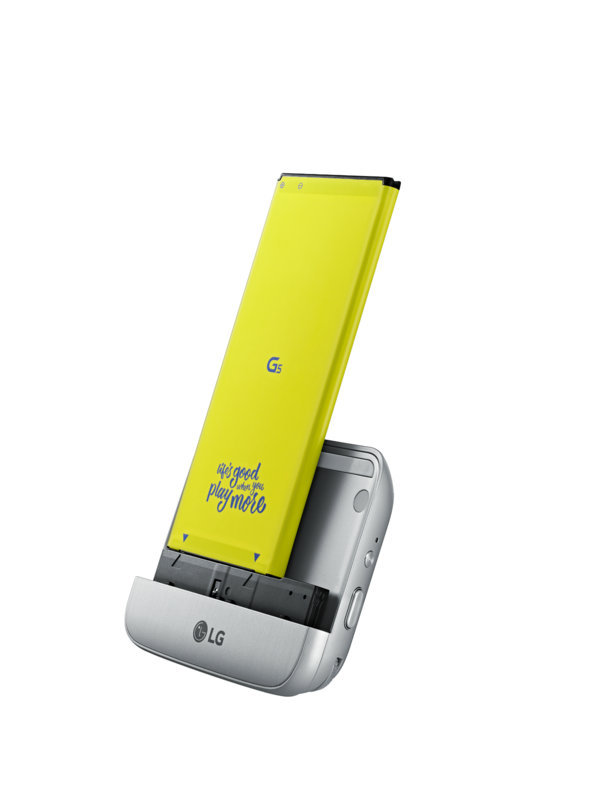 First, the G5 will boast a metal aluminum body with an "invisibly integrated antenna" and a slide-out bottom that lets you easily swap the battery. On the front, a 5.3" Quad HD IPS Quantum display with a curved glass surface promises to be brighter than that of the G4 (it goes up to 850 nits) and adds an always-on mode for glanceable notifications. LG says it has optimized power consumption for this feature so it shouldn't hurt your battery life a lot. There's an 8MP shooter for selfies above the display, but the more interesting camera setup is on the back of the phone. You'll find two cameras: a standard 78-degree 16MP lens and a 135-degree wide-angle 8MP lens, which LG says is 1.7 times wider than smartphone cameras and the widest on the market. It's even 15 degrees wider than the human eye's field of view. That should be great for landscape photography, monuments and tall buildings, and large groups of people. Beside providing better results by harnessing both sensors, the dual lens approach allows for a new Pop-out picture mode which creates a picture-in-a-frame effect. 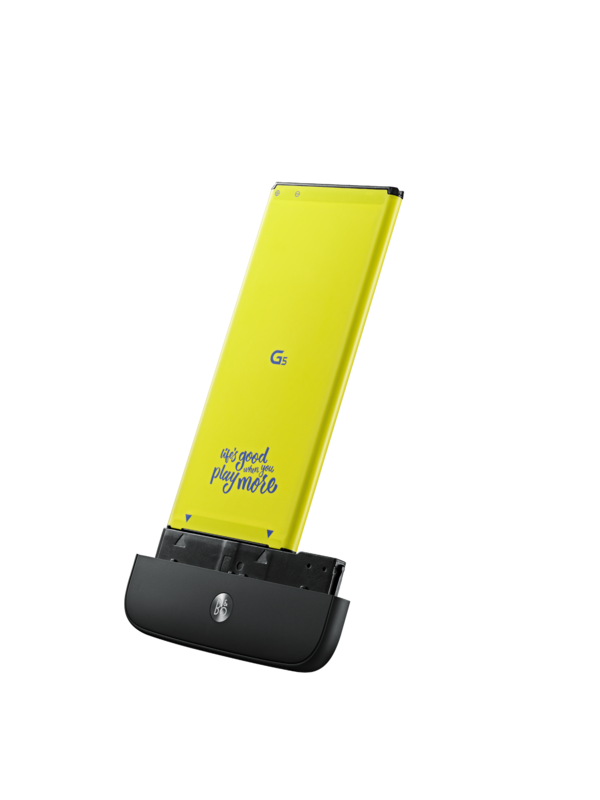 Under the hood, there's a Snapdragon 820 SoC, 4GB of RAM, 32GB of storage with a MicroSD slot, a reduced 2800mAh battery (compared to the G4's 3000mAh and the G3's 3200mAh), and all the connectivity features you've come to expect of modern smartphones. There's a fingerprint scanner on the back, NFC obviously, and a USB Type-C port for power and data transfer that also uses the newer USB 3.0 for faster speeds. Qualcomm's Quick Charge 3.0 is in tow as well. The phone runs Android 6.0 Marshmallow and will be available in 4 different colors: silver, titan, gold, and pink. 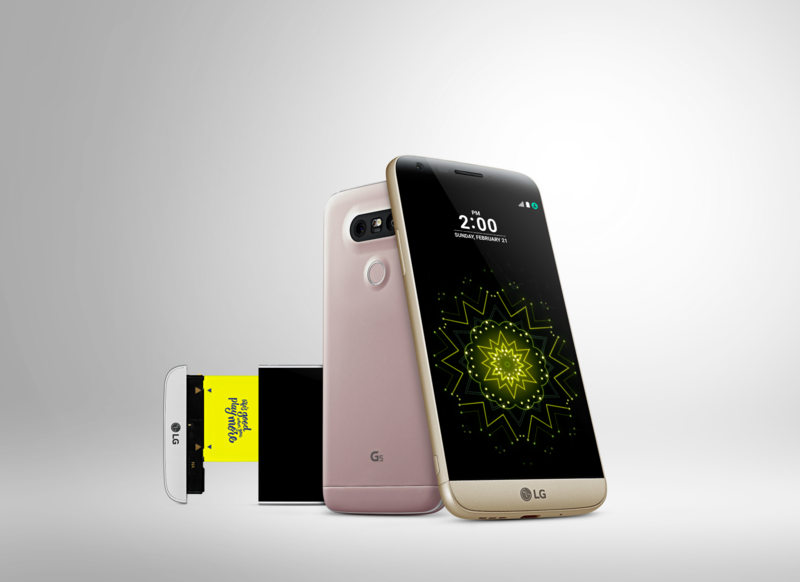 LG stayed mum about availability dates and pricing so your guess is as good as ours when it comes to that. 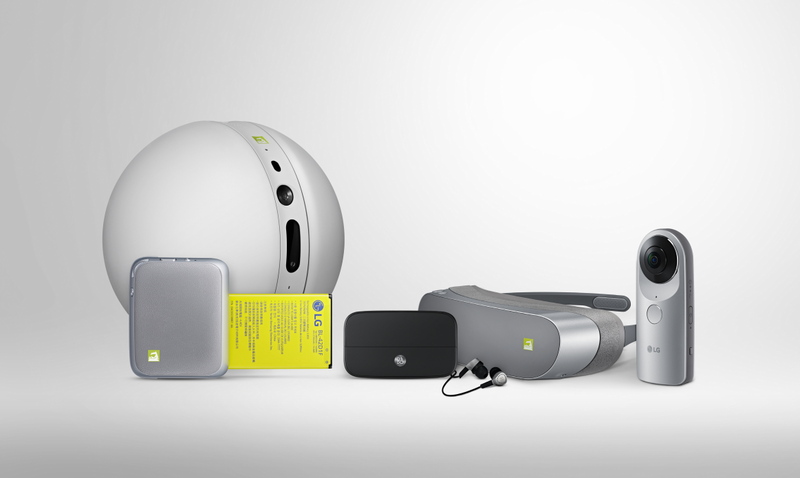 As for the G5's friends, there are plenty tagging along for the ride. Some plug directly into the phone via the removable bottom chin and the Type-C port like the CAM Plus and Hi-Fi Plus, and others connect to it through wires or Bluetooth. First, the CAM Plus adds more grip and width to the device, for better usability while taking photos. It has physical buttons for power, camera shutter, video recording, zoom, and an LED indicator. It also functions as an external 1200mAh battery. Second, the Hi-Fi Plus with B&O Play is a portable Hi-Fi DAC audio player that supports 32-bit 384KHz high-definition audio playback. 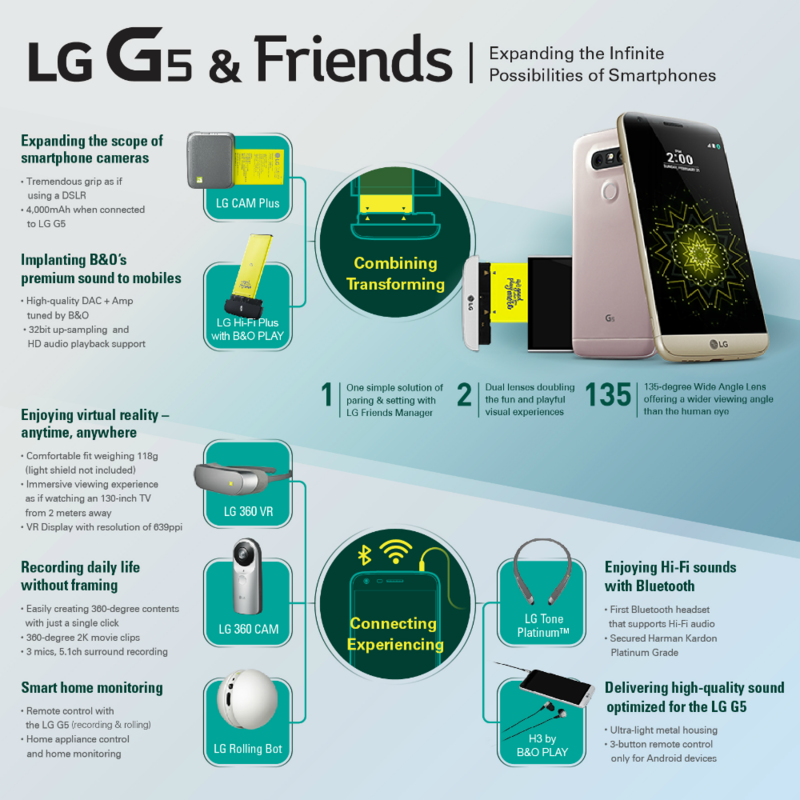 The additional benefit that it brings is the fact that it can be used with the G5 or independently of it, with PCs and other smartphones. 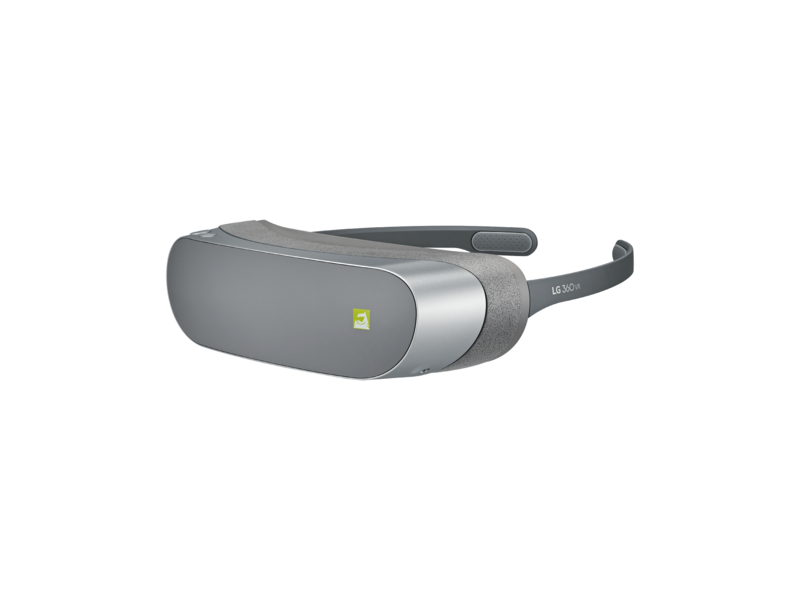 As for the additional accessories, there's the 360 VR, a VR goggle that connects to the G5 via a cable and simulates a 130" TV viewed from 2 meters away thanks to its 639ppi display. LG tries to sell the fact that the phone isn't inserted in the goggle itself by focusing on the light weight of the unit. 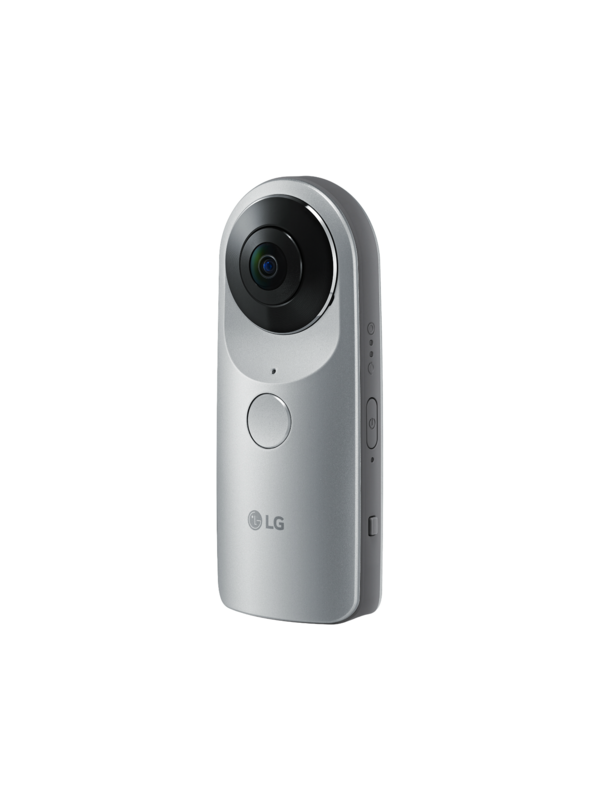 It's compatible with Google Cardboard content as well as the images and videos captured with LG's 360 CAM. Which brings us to the 360 CAM, a small camera equipped with two 13 MP 200 deg wide-angle lenses, 3 microphones, 4GB of internal memory with MicroSD slot, and a 1200mAh battery. It's capable of taking 2K videos too. The resulting images and videos can be uploaded to Google Street View and YouTube 360. Then there's the Rolling Bot, a Sphero-like ball that rolls around and captures 8MP photos. LG says this isn't just a toy, it can also be used as a pet companion, as a home monitoring system thanks to its WiFi-connected camera, speaker, and microphone, and a remote controller for other home appliances with its two embedded infra-red sensors. And finally, there are a couple of random accessories like the TONE Platinum Bluetooth earphones, the H3 by B&O Play wired earphones, and the Smart Controller for drones. As with the G5, there wasn't much detail in terms of date and pricing availability for these accessories and add-ons, but expect them to roll around at least with or after the G5.